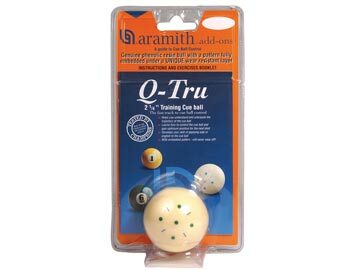 Aramith Q-Tru Training Cue Ball. The Q-Tru Training Ball will allow you to improve with only a few hours of practise. This Belgian made Aramith cue ball is marked at nine different points in the shape of a clock. The instruction booklet outlines, in diagrams, a selection of set shots with up to four variations on each shot. Each variation will make the cue ball rebound differently to gain the best position for the next shot, to complete a winning series. This simple but effective teaching tool is suitable for all types of billiard games from pool to snooker to 8-ball. Great for both beginner and advanced players!